Yesterday, we spent the better part of the day at Epcot's Food & Wine Festival. We go for the food. I can't understand people who start sampling beers and wines before noon. And after a few, it's all got to taste the same, right? And I can't understand people who go to Epcot during the festival and eat at the restaurants. With all of that luscious, semi-foreign food available, you go eat one monotone meal in Germany or Italy? Makes no sense. The first booth we came upon is brand new this year: Terra. Sounds fishy, doesn't it? It is, let me tell you. Not fishy, exactly, but chick'n-y. It's for chickens, all right. Terra's main offering is "Trick'n Chick'n Curry with Basmati Rice featuring Gardein Chick'n Breast." Ah, yes, that was the curry. Someone asked me if I'd tried any curry and I said, "Well, I remember there was curry there somewhere but I didn't have any, it must have been in blue." In blue. Let me explain. Before I go to the Epcot Food & Wine Festival, I formulate a plan. This year was the first year my plan actually worked, ie I came home feeling like I sampled everything I wanted to. I printed out the list of vendors and their food and then highlighted in yellow all of the samples I just had to have. The ones I thought I might like to try were in blue. Many were not highlighted at all. There are just some things you try once and swear never again. And then, there are those things you just know to stay away from. Like the "Belgian Waffle with Berry Compote and Whipped Cream" in Belgium. (That is not my capitalization, mind you, it's Epcot's.) Anything that said "berry" or "berries" had to be passed on, because George is certain, after his many years of disappointing food experiences that "berry" is code-word for raspberry. And we do not do raspberry. I could do raspberry; I don't have a problem with them. But George is staunchly anti-raspberry. So, the Terra "chick'n" curry was not eaten, and, as it turns out, not in blue either. Why? Because I'm a skeptic that's why and I was immediately suspicious of "Gardein Chick'n Breast." Sounds fake to me. Sounds like fake, wannabe, vegetarian wool and someone is attempting to pull it over my eyes. No thank you. Why do vegetarians have to try to eat meat that isn't meat? If you want meat, eat some dang meat. If you don't want to eat meat, eat your beans and stop trying to make meat "healthy." It doesn't work. It is not as good as real meat, stop trying to tell us it is. Fake chocolate is not as good as real chocolate and Snackwells cookies aren't just as good as Oreos. They are not. So just stop with it. So, do you think for one second that I partook of Terra's "Chocolate Cake with Passion Fruit Sorbet and Coconut Foam." Right. Like chocolate cake made by people who eat fake "chick'n" is going to be good. No thank you. So, we passed on the new fancy schmancy fake Terra. Terra my buttocks. Terra could have been a rich, bountiful harvest of wonderful non-meat samples. Instead it was a sad advertisement for fake food. Terra. Sheesh. We started in Argentina with a beef empanada (always a yum) and a grilled beef skewer with chimichurri sauce and boniato puree. George was very put off by the boniato puree, which he called Boston Market mashed potatoes. 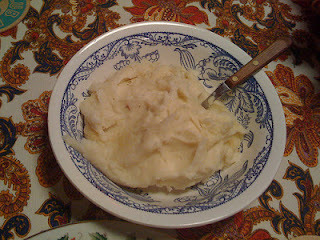 Mashed white potatoes loaded with real butter. Probably the way Paula Dean would make mashed potatoes, yau'll. "But it's not mashed potatoes," I told him. "It's boniato puree!" Well, I looked up boniato puree and it's mashed Caribbean sweet potatoes. I'm sorry, hon. But those were not sweet potatoes, they were buttery, bland white potatoes. This is the theme that colored our entire trip. While I liked them somewhat (I could do without the taste of real butter), Geroge couldn't stop tasting them in everything he ate. We had steamed mussels in Belgium. Well...George had one, which he called wet and rubbery with very little flavor. He is, of course, insane. He must be missing the "rich soul of the sea" bud on his tongue because I thought they were heavenly. In Canada, I ate the chicken (real) chipotle sausage with sweet corn polenta, which George swore smelled like Boston Market mashed potatoes. It was nothing like mashed potatoes. That was probably the best sausage I had. Better than Germany's bratwurst (an eight-inch skinny sausage on a two-inch pretzel bun--cute as a button) and Poland's kielbasa (hard to beat!). Yes, I ate all the sausage. I had to. George is also anti-sausage. We ate a wonderful filet mignon with truffle butter sauce, that reminded George of Boston Market mashed potatoes, in Canada; Mongolian beef in a strange steamed bun and pork pot stickers in China--good but not wow inducing; a lobster seafood fisherman's pie in Ireland that can only be described as a mistake; raw tasteless tuna in Hawaii served to us by a guy named Chad who kept speaking to us in Hawaiian; and a four-by-four-inch ravioli from Italy that tasted like Chef Boyardee (not that there's anything wrong with that) and, to George only, Boston Market mashed potatoes. "Can't you smell that?" He says, breathing in enormous-ravioli aroma. Smelled like cheese to me. They also had a new Florida booth this year. I was born and raised in Florida. I know my Florida. So I expected shrimp and crab, corn bread, grits, oranges, that sort of thing. But they offered us white corn arepa with Mangalitsa pork rillette and Zellwood sweet corn salad. Okay. Huh? Arepa is from Columbia and Venezuala. It's not Floridian. The Mangalitsa pig is not from Florida. What gives? You think you can toss in some Zellwood corn and call it Florida? I think not, my friend. They also had Florida shrimp ceviche with fried plantains. We don't eat our shrimp ceviched in Florida. We eat it fried, steamed, or grilled. And plantains are not a typical Florida food. They're Latino food. So, big fail all around on Florida. In Ireland, I had a "Warm Chocolate Lava Cake with Bailey's Ganache," like always. It's heaven. Ooey, gooey, chocolate heaven. And at the "Desserts & Champagne" booth we had a "Dark Chocolate Mousse with Chili and Salted Caramel." It was smooth, creamy, chocolate pudding with a punch in the throat at the end. I think the chili at the bottom would certainly keep me from overindulging. I should have chilis in all my chocolate...not. And, of course, I came home with a box of truffles from Belgium. I'll eat them at my leisure. I was stuffed. And happy. And my feet hurt. So, you know it was a good day. Boston Market mashed potatoes and all.